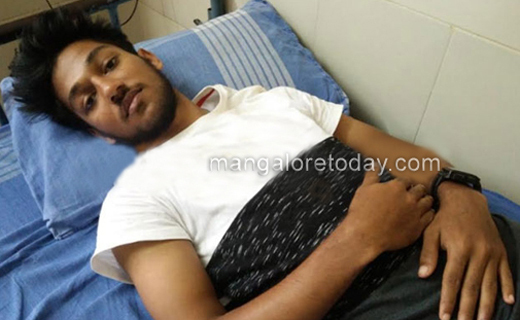 Kundapur, Aug 22, 2018: A youth was attacked by a gang of 9 men on suspicion of carrying beef in his scooter on August 22, Wednesday near Veerashiva temple in Gangolli. Abu Sufiyan(19) of Shahimohalla, here. He is persuing his engineering studies in Mangaluru college. Sources said that Sufiyan had been to his native for Bakrid. On his way back home with friend from relative’s house was waylaid and attacked by a gang on suspicion of carrying beef. They opoened his scooter seat but did not find any beef, being transported, they even damaged his scooter. He is being treated at Hospital here. Gangolli police have registered the case.